Comic #88 – Scooty Translations. | I made inky. Web comic by Ren. <3 for cephalopods! Comic #88 – Scooty Translations. Comic 88 took 2 hours to create. Sorry the comic is a bit late. There have been some personal issues going on. Comic and characters, unless otherwise noted © 2010 – Current Date Ren. This entry was posted on Saturday, June 2nd, 2012 at 7:49 pm and is filed under Comic. 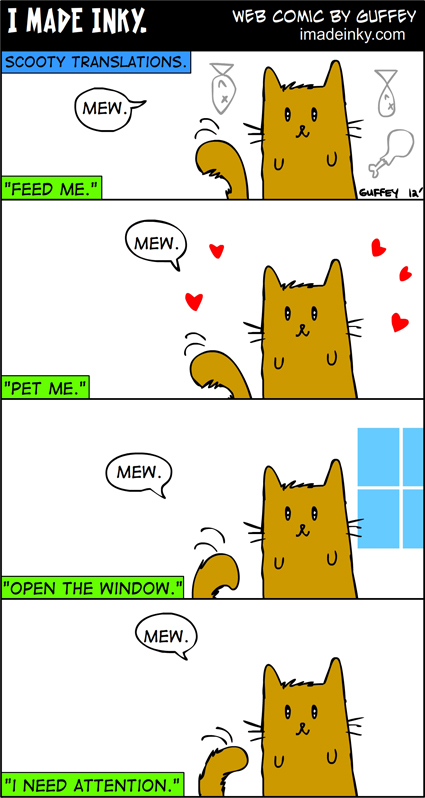 Tagged: cat, comic, cute, imadeinky, kitten, Scooty, web comic, webcomic. You can feed this entry. You can leave a response, or trackback from your own site. « Comic #87 – Sleep.